Provide comfort for the family of Annie Wynne with a meaningful gesture of sympathy. 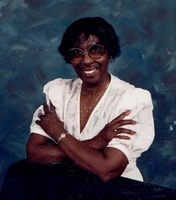 Rollins' Mortuary announces with deepest sympathy the passing of Mrs. Annie Mae Wynne, age 92 on Saturday, January 26, 2019. Funeral services were held Saturday, February 9, 2019 at 1pm in the Chapel of Rollins' Mortuary. Rev. Greg Morris officiated. Burial followed in New Jerusalem Cemetery, Greensboro with Rollins' Mortuary directing. To send flowers in memory of Annie Wynne, please visit our Heartfelt Sympathies Store. Provide comfort for the family of Annie Wynne by sending flowers. Edtric, my prayers are with you and your family during this time. I pray that the peace of God will keep and abide in your heart. Blessing to you.